Naomi Hart is the Leverhulme Trust artist-in-residence at The University of Sheffield Department of Geography for 2017-2018. Hart spent August of 2017 in Svalbard, Norway in the field with students and faculty from the Polar and Alpine Change Masters programme. This body of work comes from her observations of scientific method and enquiry there and investigates the, often opposing, man-made interventions present in the ice fields of the High Arctic. In the early 20th century, coal mining became the dominant industry of Svalbard. Recent years, however, have seen both the closing of the mines and their structural demise, due in part to heavy snow melt, one of the increasingly visible effects of global warming. Svalbard, because of its polar location, has become a site of scientific interest wherein researchers measure atmospheric and environmental changes. A landmass once mined for energy is now mined for data and information. Furthermore the drastic change in landscape from melting permafrost has prompted new explorations for making unprecedented use of natural resources, such as investigating whether edible plants can be grown in a land never before cultivated. Taking mass balance—the notion that energy and matter can neither be created nor destroyed—as her premise, Hart explores the cyclical (and conflicting?) nature of the Arctic landscape. Hart belongs to a long tradition of artists accompanying scientific missions. James Cook and Charles Darwin enlisted artists to record human encounters, biological specimens and newly charted landscapes on their journeys of exploration. However, Hart turns her eye toward the process of enquiry, the experience of researchers and students in the field and records the indexes of human action in the landscape. Hauntingly opaque human figures, whose indistinct forms recall the first photographs of Arctic explorers, give the viewer a foothold into potential narratives but resist the clarity desired by final conclusions. Likewise her use of found text, ranging from academic publications and poetry to journalistic observations by researchers, provides a glimpse of the written experience of the Arctic. Yet her fragmentation of those texts, in their burial, concealment, and decontextualisation, mirrors the abstracted data researchers must inventively extract and interpret in the field. Like the early Arctic explorers and contemporary scientists, the viewer encounters fleeting glimpses of clues of what has been experienced both in and by the landscape. Tools used for measuring, the remains of a collapsed coal mine, decaying animal skeletons, new and abandoned architecture echo throughout the series as slowly revealed or fading to the point of disappearing. Her use of form and colour make manifest the deeper tensions from opposing forces: cold/heat, protection/danger, conservation/consumption, decay/growth. 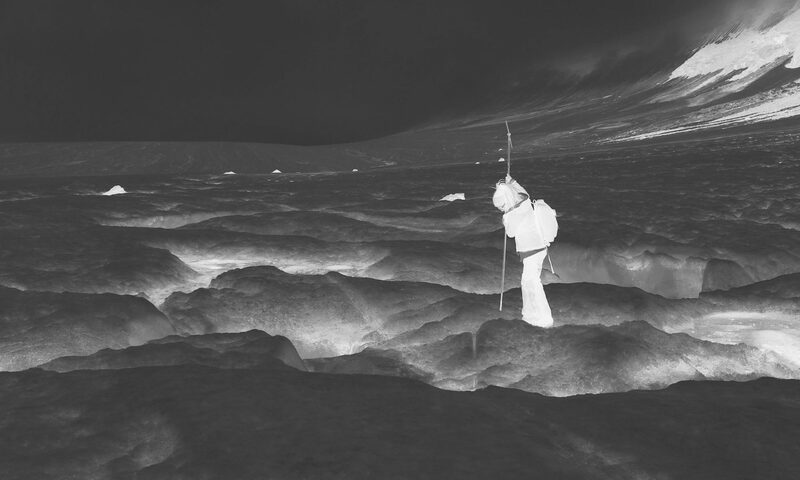 Materials directly reference their subject: the carbon cycle is represented by using the very coal mined on the outskirts of Sheffield, cryoconite collected by researchers and paint thinned by glacier water from the Arctic. Hart’s investigation of how the invisible is made visible offers a timely response to the impact of current geopolitical interests on the ice fields of the Arctic.